Anyone can be a shoplifter. This is the mindset that you need to have if you own, manage, or even work at a store. You can’t profile someone based on their race or gender because shoplifters are of every race, gender, religion, and size. However, there are a few things that you can do in order to identify a shoplifter. Knowing these signs will help you stop them before they leave the store. Shoplifters almost always behave in a certain manner. They’ll avoid eye contact. If you ask them if they need help, they won’t look at you, will dismiss you quickly, but they’ll still keep an eye on you to see where you are and if you’re looking at them. 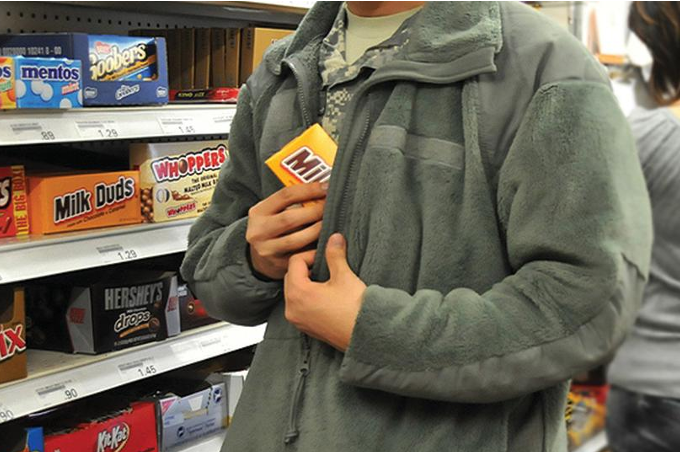 For the most part, a shoplifter will wear an oversized coat or baggy sweater, and might even carry a large bag. Obviously, the baggy clothes and bag make it easy to conceal the items that they’re going to steal. In some cases, shoplifters work in pairs. One will distract any employees nearby while the other fills their bags (or the waist of their pants) with merchandise. That person will quickly exit the store before the drama or distraction is completed. Shoplifters sometimes carry razor blades that they use to open packaging. This is particularly true if the packaging is bulky and has a sensor on it. When a shoplifter is using their razor, they’ll look for a quiet corner and try to hide so that no one sees what they’re doing. This action makes their behavior particularly suspicious, but easy to spot if you know what you’re looking for. Changing rooms, where people go to try on clothing, are another shoplifter hotspot. Some will act as though they want to try things on, but what they’re really doing is removing tags, concealing sensors (this is sometimes done with a foil-lined bag), and stealing those very items. A good way to prevent this is by having your changing rooms manned at all times. If those doors remain locked and the employee has to keep an account of every item taken to be tried on, then the thief is less likely to get away with it. Most regular shoppers will understand why they have to through this process, so don’t worry about it keeping them away. These employees are kind of like security guards, only with less training and no weapons. Instead, they’re trained on how to spot and deal with shoplifters. They might be able to catch the thief in the act, or be ready and waiting for them when that person walks out the doors. Since most theft prevention employees should be trained to defend themselves, it’s less dangerous to for them to do this than regular store employees. You mostly see these types of employees in a large department or grocery stores. You never want to accuse someone of shoplifting outright, even when you’ve seen them put an item in their pocket. Instead, approach them and ask a question like, “do you need help with that ‘item’ or do you have any questions about it?” Knowing that they’ve been caught, the would-be thief will most likely remove it from their pocket and either purchase it or put it back. A few might cause a scene and bolt for the exit, which is why other employees need to know what’s going on before you confront the person. The main reason behind never outright accusing someone of theft is because they could turn around and sue your store for discrimination. This is also why you never want to profile someone. That person may have accidentally slipped that item into their pocket, or just needed a secure way to carry it until they could get to the cash register. Or your eyes might have played tricks on you. Mistakes happen, so you need to give people the benefit of the doubt until you’re absolutely sure that they were planning a theft. Now that you know how to spot a shoplifter and make shoplifting impossible in your store, you’re that much closer to making your merchandise secure. Many shoplifters behave in a certain way, and as long as you keep an eye on what they’re doing, they’re less likely to get away with it – especially in your store.